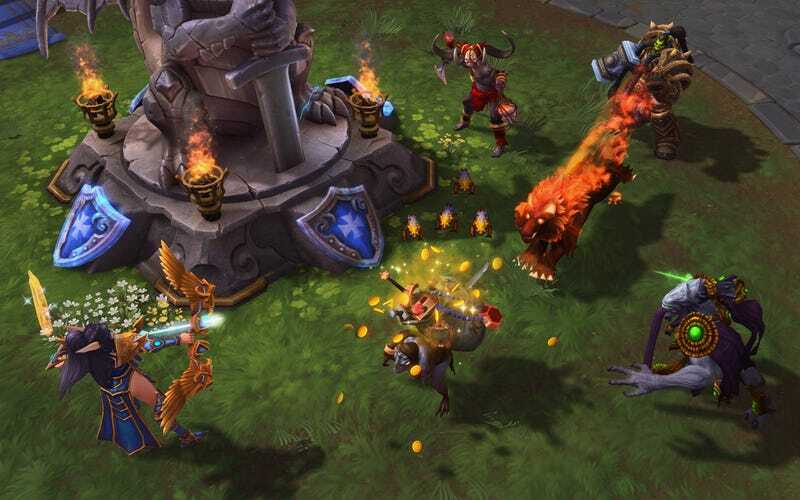 One major difference between Heroes of the Storm and its competitors Dota 2 and League of Legends is the game’s “talent system” that eschews individual character experience and items players can purchase from an in-game shop. Was Blizzard just trying to set itself apart by abandoning genre conventions? Not entirely. GamesBeat: It seems like you’re being very creative with new characters. You’re breaking MOBA conventions. Is that a deliberate choice, to differentiate yourself? Gonzales: Somewhat? A lot of it stems from the talent system. We struggled for a long time with our item shop. When we were exploring just what kind of game we were making, well, a lot of these games have item shops. But when we did it, we thought, wait, Arthas has Frostmourne. Why would he need to buy a fire sword? That’s why we started exploring the talent system, to enhance what’s already there for the characters. That’s what people love. That’s what they’re cursed with. That’s what they’re attached to. The talent system gave us freedom to do things that are really outside the box. We could never do an Abathur if we didn’t have the talent system that we have, if we didn’t have the shared experience. Now that we have those freedoms, we have an ability to explore so much. That’s the thing that fascinates me the most about some of the new heroes coming on. Even things like Leoric’s Undying trait. This is wild. A lot of it has to do with the talents, the shared experience, what stuff like that enables in the mechanics. The developer’s answer makes perfect sense. Since Abathur doesn’t participate in battle directly, it’s hard to imagine the critter holding his own in a game like League of Legends. Sitting behind your defenses in League means that you don’t accumulate enough gold or experience to properly develop your character over the course of the game. Before seeing Gonzales’s justification for the talent system, I’d assumed that Blizzard had chosen to jettison individual xp and in-game items because both played a huge part in making Dota 2 and League of Legends enormously complex and intimidating to newcomers or casual players—characteristics HOTS developers have often said they wanted to avoid to help make the game as accessible as possible. The talent system definitely does help keep Heroes of the Storm refreshingly simple compared to its close genre peers. But the suggestion that it also allows the game’s developers to create whacky new kinds of characters is a far more intriguing and promising thought for the future of this game. As I noted in my review of Heroes, Abathur and the other oddball characters like him are some of the coolest, most novel parts of this game. Now that HOTS has officially left beta and officially launched, Blizzard has said that it’s planning to add a new character to the game roughly every three weeks. Hopefully we’ll see more bizarre and inventive creatures like the Zerg monster.